Take a quick look at what you need to do to get ready for your NDAFW event! National Drug and Alcohol Facts Week® promotional video, introduced by NIDA Director, Dr. Nora Volkow and NIAAA Director, Dr. George Koob. Events: Locally planned and hosted school and community events focus on providing teens with the scientific facts about drugs and alcohol. Drugs and Alcohol Chat Day: This annual live online chat held between high school students and NIDA scientists, during National Drug and Alcohol Facts Week®, gives students from around the country the opportunity to ask the questions they most want answers to about drugs, alcohol, and drug use, including drug and alcohol effects, how to help friends or family that are abusing drugs, and what causes addiction. Our expert scientists give them the facts. Partnerships: NIDA and NIAAA works with leading organizations, media outlets, and other Government agencies to spread the word about NDAFW and SHATTER THE MYTHS®. How can I host an NDAFW event? NDAFW event organizers must be 18 years or older and have ties to an organization that educates teens about healthy living. Teens that are interested in hosting events must partner with an adult who meets this criterion (including your parents!). EVENT TIP: Including teens in the planning and hosting of NDAFW events helps make them educational and fun. Teens are also particularly helpful in reaching out on social media and using technology to help promote NDAFW events. NDAFW events have been held with a variety of organizations, including middle and high schools; local nonprofits or other community-based organizations; state or local health departments; PTAs; faith-based organizations; afterschool clubs; and more! See Highlights from NDAFW Events to stay up to date. How do I learn about upcoming or past NDAFW events in my area or around the country? Check out events already registered on our NDAFW Events Map to see who is hosting an event in your area. Search for your city or state name from the previous year’s Drug and Alcohol Facts Week events. How do I connect with other NDAFW event holders? Tweet about NDAFW—Be sure to use our hashtag #drugfacts. Check out our Registered Events page to find others in your area. Sign up for the Drug Facts Newsletter, featuring stories and ideas from event holders. How can I use social media to promote my NDAFW event? Tweet, blog, or update your Facebook status to help spread the word about your NDAFW event. Share information with your family and friends that will SHATTER THE MYTHS® about drug abuse. Go to the Promote With Online Toolkit page for suggestions on how to create your messages. If you tweet about NDAFW, be sure to use our hashtag #drugfacts. What if my event is not being held during NDAFW? We would still like to hear about your event and support you in any way possible. While you won’t be able to Register Your Event, have it listed on the Events Map, or promote it as an NDAFW event, we welcome you to use NIDA’s free resources and materials. We are still here to answer any questions or offer advice. Please send an email to drugfacts@nida.nih.gov with information about your event, the dates, and any questions you may have. What if my NDAFW event is not showing up on the Events Map? All approved events will be displayed on the Events Map within 2 weeks of submitting the registration form. If your event is not displayed within that time period, please send an email to drugfacts@nida.nih.gov. How do I send event photos and videos for posting on the NDAFW website? Be sure to have each person featured in your photos and videos sign a release form. The form gives us permission to use their image on our website. If we don’t have release forms, we can’t post the items to our pages. Please email your release forms, photos, and videos to drugfacts@nida.nih.gov, and we will post them to our Flickr page. What is the GRAMMY Foundation® and MusiCares® Teens! Make Music Contest? See Teens Make Music Contest for contest rules and instructions. To see winners from years past, check out the songs. How can I help support NDAFW but not host an event? You can help us promote NDAFW by becoming a Partner with NIDA, by giving NDAFW a Shout Out on Social Media (tweet, blog, or update your Facebook status), and by using NDAFW Brochures and Posters to help spread the word about NDAFW. What is the National Drug & Alcohol IQ Challenge? During National Drug and Alcohol Facts Week® and year round, teens can test their knowledge about drugs, alcohol, and drug abuse by taking the interactive National Drug and Alcohol IQ Challenge quiz. A new challenge is posted annually during NDAFW. EVENT TIP: The online quiz can be projected onto a screen during events or printed for individual use. What is Drugs & Alcohol Chat Day and how can I participate? 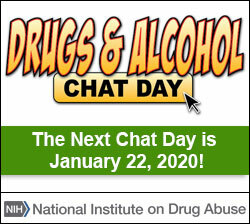 National Drugs and Alcohol Chat Day is an annual live online chat held between high school students and NIDA scientists during National Drug and Alcohol Facts Week®. To learn more, check out the Drugs and Alcohol Chat Day page.